Hard to believe it’s already been a year since we opened our second location, the Parched Eagle Taproom, on Friday May 12th. So, next Saturday is the first anniversary of the Taproom and you’re invited! This beautiful space (that to me has an Art Deco feel) has moved our business forward in a very positive way and we’re looking forward to celebrating with you. Our featured beer release for it is the return of our acclaimed ESB GRAINNE’S SPECIAL BITTER! GSB was named by Isthmus beer writer Robin Shepard as his favorite local beer of 2015 and it’s exceptionally popular at both of our locations whenever we have it on tap. That said, and not to be over-shadowed by GSB, A PUBLIC AFFAIR American Pale Ale will also be making its debut at the Taproom on Saturday! Our other APA that features Sorachi Ace hops is brewed annually for the WORT Community Radio block party (except for last year when I forgot because we were so busy opening the Taproom). The party starts at 3 and both beers will be on tap when we open. Again the address is 1444 E. Washington Avenue on the near east side of Madison. Speaking of our main APA Crane Ale: a beautiful painting by David C. Mueller now hanging on a wall at our Taproom is a preview of big developments on our horizon. If you see me there on Saturday I’ll tell you all about it! Also JOLLY FROG food cart will be out front from 5 to 8 serving up their excellent Mexican fare! PLEASE NOTE: our Westport Brewhaus will be CLOSED all day so the whole Parched Eagle family can celebrate the Taproom anniversary. Jamie the Magnificent Eisbock release party Tuesday February 27th! Yes next Tuesday is the release of a very special beer which will also conclude our series of big/dark/malty winter beer releases. The release party is being held at our Taproom at 1444 E. Wash starting at 3PM when we open. Last December we collaborated with our good buddies the House of Brews to brew an Eisbock in honor of our dearly departed comrade Jamie Cowles, who died in January 2017. Jamie was a lover of big malty high ABV ales and lagers so an Eisbock seemed like an appropriate beer to brew in his memory. Brewmasters Page and Jim collaborated on an excellent recipe that took forever to ferment in our 2.5 barrel Psychobrew fermenter that was just part of the epic saga that the creation of this beer turned out to be. Elegantly smooth and dangerous at 9.2% ABV, we hope you’ll be able to join us at the Taproom on Tuesday 2/27 for the release of this ode to Jamie the Ice Man! Jamie had his Tuesday night drinking club: hence the release on a Tuesday. We anticipate many members of that august group will be in attendance. 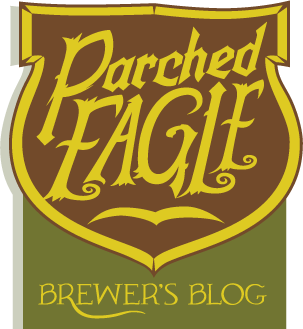 Join us for details on this the most difficult beer to create in Parched Eagle history! I’m brewing that day but plan on getting to the Taproom from the Westport Brewhaus by 5:30-6. Yes next week features the release of two new beers at each of our locations along with the return of Chachalaca American Stout at our Westport Brewhaus AND the debut of Parched Rider Coffee Stout at our Taproom at 1444 E. Wash on Saturday 2/17! Before the two stouts as mentioned is the release of the two new beers, the first of which is a collaboration beer with Working Draft Brewing Company that is opening in the Willy Street neighborhood on the near east side of Madison in coming weeks. Working Draft Brewing Company head brewer Clint Lohman and I brewed a one barrel batch of this collaboration Weizenbock a few days before Christmas and it turned out really well! 7% abv and a beautiful mix of banana/clove and rich bock malt character. Collab Weizenbock will be on tap when we open at 3 on Tuesday 2/13 at our E. Wash Taproom and we’ll be joined by the Working Draft dudes around 4 or 5. Ein prosit! Then on Valentine’s Day Wednesday 2/14 we’re releasing our first new (non-collaboration) beer of 2018: Smooshface American Brown Ale! Its name comes from one of many nicknames for our bartender Erika’s charming little canine Valentine. So: Smooshface is being released on Valentine’s Day and Smooshface herself will be there. Meanwhile the beer is a hop-forward American Brown Ale featuring a rich malt character and Chinook and Amarillo hops. It will be on tap at both of our locations when they open at 3. Then as mentioned on Saturday 2/17 we’ll have the release of Parched Rider Coffee Stout at our E. Wash Taproom and return of Chachalaca American Stout at the Westport Brewhaus! The base beer for Parched Rider is indeed Chachalaca. It’s a collaboration with Let It Ride cold brewed coffee and the addition of Let It Ride’s java adds an excellent caffeinated aroma/flavor dimension! Meanwhile Chachalaca was the first stout brewed in Parched Eagle history and is inspired by the likes of Bell’s Kalamazoo Stout and Sierra Nevada Stout. Lots of roasted barley and chocolate malt coupled with big American hops (Northern Brewer, Simcoe, and Chinook). 6.3% ABV and 54 IBUs. Hope to see you at either of our locations during our big February beer releases week! Verily shall Verily Belgian Dubbel return Friday 12/8! I write this while caffeinating on this chilly Thursday morning before heading up to our Westport Brewhaus to keg a new batch of Verily Belgian Dubbel. This year-round beer for us has been 2017’s proverbial problem child with the last two batches we brewed during the summer not turning out well, leading to us pulling them off tap lines at both of our locations. Why did they not turn out well? Because I used unhealthy yeast for both batches so it was my fault and for that I apologize. With that said I’m excited about this new batch and have been telling our newer bar tenders who haven’t had a good batch of Verily yet to get ready! Not only did I use healthy yeast this time I also switched from Wyeast’s 1214 Belgian Ale to its 1762 Abbey Ale II, which is the strain I use for Stella Belgian Dark Strong Ale. Simply put I feel that 1762 is (has been) a more reliable performer for us. Speaking of Stella look for it to return on tap within a couple of months! BUT before that we have the return of Stella’s “little” brother Verily! Checking in at 7.8% abv, verily shall Verily return on tap our E. Wash Taproom tomorrow 12/8 and at our Westport Brewhaus as soon as a tap line opens up there (i.e. it’s on deck). This Wednesday Calicious California Common returned on tap at both of our locations after a surprisingly successful debut in September. I intended the release of Calicious as an ode to the end of summer and really didn’t know what to expect in terms of customer reception to it. In fact I wasn’t sure how good it was going to be until I kegged it and put it on tap at both locales and (I too) was knocked out by how good it was! For reference there was one other beer in our history that I didn’t realize just how good it was/turned out until tasting it on tap: Grainne’s Special Bitter ESB back in 2015. Calicious sold out within two weeks back in September. So, we decided to brew a double (two barrel) batch of it and it turned out well. Calicious: smooth/easy drinking/light-medium mouthfeel yet full flavored. A bit hop-forward (and is dry-hopped with Simcoe) including a somewhat bitter finish that is balanced out by a nice/soft German pilsner malt character. This includes a nice crisp lager finish. Beautiful light amber color, too! Come on by for a delicious Calicious!